People in Truro and Honiton may have noticed what appears to be an increase in the number of "bobbies on the beat" this week. They are the towns' first Police Community Support Officers (PCSO) employed by Devon and Cornwall Constabulary under a pilot scheme being run by the Home Office to reduce the fear of crime. Ten PCSOs have started work in each town after completing training in law, first aid, court procedures and self defence. The PCSOs wear uniforms similar to traffic wardens with peaked caps which bear the blue and white band and a blue badge saying Police Community Support Officer. They have the power to use force to detain, but not arrest, members of the public for up to 30 minutes. However, they do not carry CS gas or handcuffs. The introduction of PCSOs around England and Wales has been a controversial decision, with some officers calling it "policing on the cheap". But Sergeant Brent Davison of Honiton police, backed the PCSOs, saying: "They can deal with low-level crime such as anti-social behaviour, but they are primarily in a support role. "They will be able to deal with victims of crime, they will be on foot and pick up information that perhaps we miss and help officers do their job." Honiton PCSO Malcom Burgess used to work in local authority enforcement. He said: "Now I will be working with the community as part of the community, helping people with any problems they have." Former baker Darren England said: "There is a lot to learn, but people's reaction has been very good." The pilot scheme will run for two years and could be extended around the rest of Devon and Cornwall if successful. 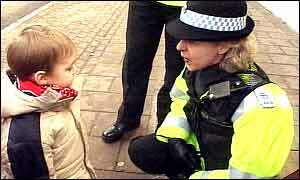 The Metropolitan, West Yorkshire, Lancashire, Northamptonshire and Gwent forces are also trialling the PCSOs.